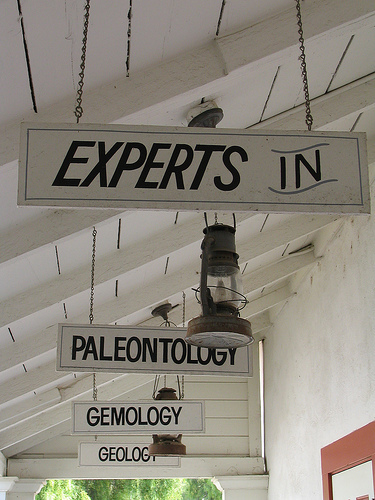 What (Who) Is An Expert? I originally wrote the following in January of 2012, less than two years after my departure from Pratt & Whitney Rocketdyne. For some reason it got a bit out of control for me and I never posted it. I’m either breaking it into two separate posts, or removing some notes from the end and posting it as a standalone. Actually, I’m doing the latter for now – maybe working the removed notes into a second post at a later date. Are you an “Expert” in anything? How do you know? If you say you are, how do we know it’s true? Furthermore, what is the difference between being an expert and having some – or lots of – expertise in a particular subject or field of knowledge? I was reminded of this problem a while back while talking to a friend and former colleague about the situation at my old company and, especially, how the tool I was the project manager for and had introduced back in 2002 was doing. I got the impression the issue of expertise was still a hot one and the situation hadn’t changed much since we first tackled it. In 2001 I was a member of the Knowledge Management team for my former employer. One of the big problems we were grappling with was how to create an online directory or “Yellow Pages” of employees, including a way to search by expertise. The IT department had gone through at least two, possibly three, iterations using HTML as the basis for creating and presenting the information. Unfortunately, people moved around too frequently and the job of keeping it up-to-date was daunting; actually pretty much impossible. We were looking into other ways to achieve the results we thought were necessary to improve our ability to find the right people at the right time. When the member of our KM team who was working on it decided to retire in the Fall of that year I volunteered to take over the effort. I soon came to the conclusion we were never going to be successful doing it the way we had been. Due to policies I had no control over, there was no way to connect what we wanted to create with HR’s database, which would have simplified the effort somewhat. Even more important, I realized what we needed was far more than just a directory. We needed a way for people to truly communicate with each other; a way to ask questions, receive answers, and conduct discussions on the appropriateness and efficacy of proposed solutions. This wasn’t what a mere directory of names and titles would give us. I set off to discover something better. In my quest I came across a few tools that began to address the problem. The two that stood out back then were Tacit’s KnowledgeMail® and AskMe Enterprise. In fact, I ultimately conducted a trade study of both, as well as a home-grown (we were part of the Boeing Company back then) system that was designed to help Airplane Mechanics share what they knew and learned about the airplanes they worked on and their various intricacies. I quickly eliminated the latter of the three and concentrated on the two others. In the end I presented my findings to our Chief Engineer. Based on the criteria I used, AskMe was the winner as it addressed our security concerns in a manner far more to our (and our Lawyers’) liking. Do we Control The Assignment of Individuals as Knowledge Providers &, if so, How do we Qualify And Present Them Within AskMe? We developed a set of responses for each of these issues, the first of them being the most important and the one that was at the root of our disagreements, e.g. we decided to let everyone register and self-select as “having expertise” or knowledge in any field we provided a category for. The biggest bone of contention was that some of our senior technical staff were worried people would overreach and end up providing bad information which might be acted upon. When you design and manufacture products that can easily kill a half dozen people and cost tens if not hundreds of millions of dollars of loss, you tend to be a little cautious. This was understandable. However, many of us felt the likelihood was next to nil, as we expected the internal equivalent of crowd-sourcing would likely take care of it. In fact, in the over nine years I led the project there was only one instance in which I was asked – by a panic-stricken Manager – to remove something from the system. I was able to do so immediately, though I took pains to copy and retain the information in case of a dispute. We decided to take a few more steps to help users decide for themselves who were the most authoritative people in the organization, among them the labeling of members of the Technical Fellowship, Process Leads, and others in recognized positions of authority. So . . . how do we determine what constitutes expertise? Here’s the problem we had with AskMe. Do we only allow recognized “Experts”, formally organizing our expertise, or do we allow it to become more organic and emergent? In a culture that actively encourages hoarding knowledge through its exalting of patents and intellectual property rights in general, it’s hard to get people to share. Yet feedback to the sharing of knowledge connects people and their behavior to the world around them. It gives everyone the chance to realize how their behavior influences the success of their organization. Effective feedback will reinforce positive behavior and correct negative behavior. The ability to give and receive feedback is a must for leaders who wish to have honest and direct relationships with employees. Ultimately, it became obvious that the real power in what we were doing was not the listing of “experts,” but rather the facilitation of conversation and discussion. It also became apparent to me that what we had was not so much an expertise location tool in AskMe, but a powerful social media platform that allowed us to securely share information and knowledge about our products and processes. It was an excellent system, a precursor to the types of platforms most enterprise size organizations are currently using, and collapsed within a few years of my departure. To say it was disappointing to see nearly a decade of work be allowed to just fade away and disappear was deeply disturbing, and disappointing. Now, as Aerojet Rocketdyne it’s been several years they’ve had a project to create a front-end that will allow the remaining database (not experts) to be queried, but it’s still on the back burner as far as I can tell. Maybe if I live another 50 years (not likely, since I’m 70) I’ll hit the jackpot with an organization that truly understands the value of these kinds of platforms/utilities. Nah! This entry was posted on Wednesday, December 13th, 2017 at 2:26 pm	and posted in Business. You can follow any responses to this entry through the RSS 2.0 feed. « I Hate Time Cliches, But They Fit!